Bringing together on site all those involved would not only have resulted in high costs but would’ve also been virtually impossible, time-wise. So, it was decided to hold Webex conferences. “These conferences dictated our lives for four months,” adds Sven Quandt. ”But they offered us the opportunity to even discuss trifles.” In the phone and video conferences, processes and components for the buggy could be analysed and discussed. After very exciting and successful years with the MINI ALL4 Racing, the X-raid team presented the MINI John Cooper Works Rally! Based on the, 2016 launched, new MINI Countryman, the race vehicle was changed in numerous areas, with the headlights and the silhouette being adapted from the production car. Compared to its predecessor, the team’s new challenger had been enhanced in several areas: further developments made for a lowered centre of gravity, improvements of several performance features and improved drivability. The tubular steel frame was a new design and allowed for stowing a third spare wheel in the lower section of the car. With this move, the designers of the vehicle created the necessary room in the rear for placing the cooling system at a lower point. At the same time, the new MINI John Cooper Works Rally also represented a step forward when it came to the aerodynamics. To achieve this goal, the desert racer spent numerous hours in the BMW Group’s wind tunnel. 2017 the FIA altered the technical regulations for all-wheel drive cars: inter alia, the spring travel was extended and the minimum weight reduced. The engineers attended to every section of the MINI and succeeded in lowering the weight to the allowed minimum. In December 2010, X-raid made a small sensation by suddenly presenting the MINI ALL4 Racing. 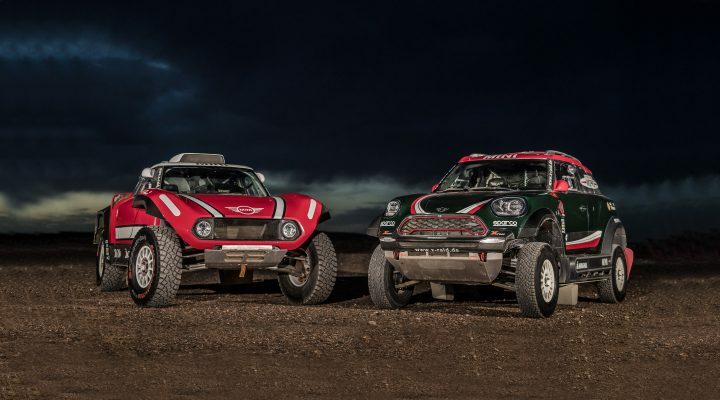 In a very short period of time, the team had created the rally challenger based on the MINI Countryman. Once again, the cooperation with Magna Steyr, CP autosport and Faster proved to be flawless and on December 6th, the French pairing Guerlain Chicherit and Michel Périn entered the cockpit for the first rollout – just about 90 days after the start of the project. Stéphane Peterhansel secured the vehicle´s first win in the Abu Dhabi Desert Challenge. 2012 the team celebrated its major breakthrough: Peterhansel won the Dakar! In den following three years the MINI ALL4 Racing was unbeatable in the legendary marathon rally. In the beginning, all three spare wheels were placed in the rear of the vehicle. Later on two of the spare wheels where placed below the driver and navigator, to lower the centre of gravity and improve the drivability of the MINI. A few years after the successful off-road rallying debut with the BMW X5 CC the team switched to the BMW X3 CC. On December 17th and 18th of 2004, the team and Magna Steyr – who had secured the deal to build the production version of the X3 – and BMW opted for building the new off-road rally vehicle. Götz Engineering and Heggemann undertook the task of designing the chassis, with Magna Steyr being responsible for the design of the suspension and body. There, the team also assembled the first BMW X3 CC and on August 17th at 02:45 AM, it drove out of the hall for the first time. In the following years, the BMW X3 CC secured numerous wins and also became a very popular customer car. In addition to many individual successes in off-road rallies, the X3 CC secured several FIA World Cup titles for X-raid, won the 2011 Silk Way Rally and finished fourth in two Dakar Rallies. When entering the cross-country sport, the BMW X5 was already a step ahead. Two years before its public launch in Geneva, the team already used BMW’s all-new twin-turbo diesel technology. And in addition, the team was provided with a BMW X5 body half a year before the car hit the market. This body was shipped from the USA to Germany to allow the team to mold the body parts. Later, these model parts were used to create a carbon-fibre skin to cover the vehicle’s space frame. The chassis of the cross-country rallying version of the X5 was designed in Munich in cooperation with an engineering office, while the assembly of the car was executed at X-raid. “The chassis and the body work were supplied shortly before Christmas”, recalls Sven Quandt. “Following several months of build-up work, we travelled to Italia for our first tire test. And we made our debut at the Morocco Rally.” A short time later, the team celebrated its first win – in the Baja Germany and courtesy of Grégiore de Mévius.